Despite the huge differences between Venus' and Earth's atmospheres, data from ESA's Venus Express satellite finds that the planets produce lightning in surprisingly similar ways. 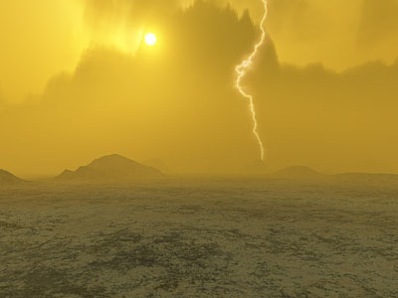 This artist’s concept depicts lightning in Venus' thick atmosphere. Image: J. Whatmore. Although early missions such as Venera, Pioneer Venus and Galileo reported evidence for optical and electromagnetic waves that could be produced by lightning, the topic has been much debated given Venus' very different atmosphere to our own planet's – its surface pressure is nearly 100 times greater than that of Earth and 500 degrees hotter. Now, thanks to Venus Express' magnetometer, scientists have confirmed that lightning is also a common occurrence on our neighbouring planet. Dr Christopher Russell, who presented the results at the European Planetary Science Congress today, says that the rates of discharge, intensity and spatial distribution of lightning are all comparable to the behaviour of lightning on Earth. "Short strong pulses of the signals expected to be produced by lightning were seen almost immediately upon arrival at Venus, despite the generally unfavorable magnetic field orientation for entry of the signals into the Venus ionosphere at the altitude of the Venus Express measurements," he says. Like Earth, when clouds form on Venus, energy from the Sun that has been deposited in the air can be released in a very powerful electrical discharge. The mechanism is thought to involve the collision of cloud particles, which causes a separation of electrical charges. As positively charged particles rise, negatively charged particles sink and the charge differences spark the formation of lightning. Around 100 such lightning discharges occur per second on Earth, and the new Venus Express data suggests a similar strength on Venus. "We have analysed 3.5 Earth-years of Venus lightning data using the low-altitude Venus Express data – 10 minutes per day," says Russell. "By comparing the electromagnetic waves produced at the two planets, we found stronger magnetic signals on Venus, but when converted to energy flux we found very similar lightening strength," says Russell. The data also revealed that lightning is more prevalent on the dayside than at night and occurs more often at low Venusian latitudes where the solar input to the atmosphere is strongest. "Venus and Earth are often called twin planets because of their similar size, mass, and interior structure. The generation of lightning is one more way in which Venus and Earth are fraternal twins," adds Russell.